The plan is to have a self-contained game about flying saucers, hillbillies and kidnapped cows that has the feel of a board game with miniatures. 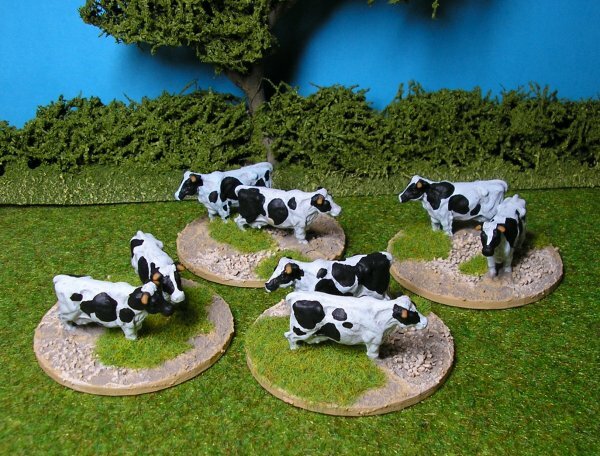 The number of figures involved will be relatively small (to begin with) and I hope to be able to make enough scenery for a 6ft x 4ft table, the main component of which will be a farm. Obviously I can use the farm for many different games so it will be a worthwhile building project. 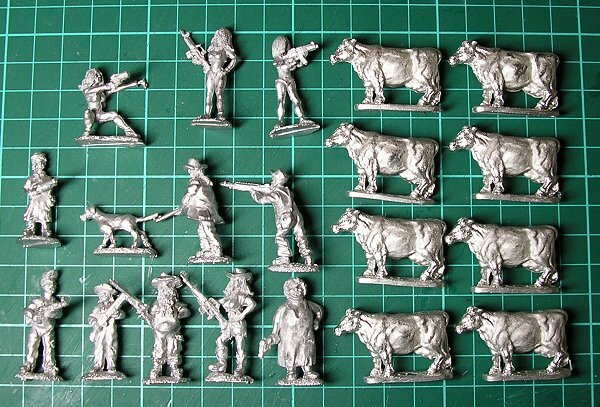 To begin with I am using a hillbilly family and some girl campers from Britannia Miniatures,some small aliens from Black Cat Bases and some Mega Miniatures cows. 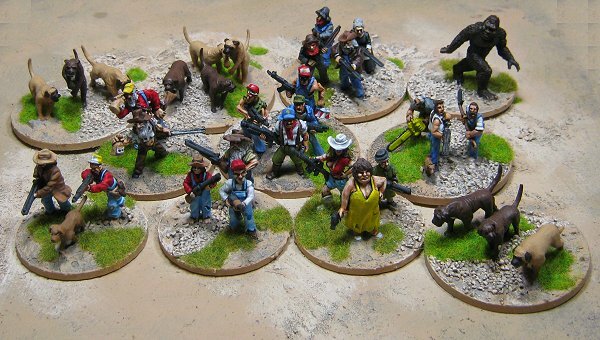 Here are the hillbillies, well-armed camping girls and the cows. 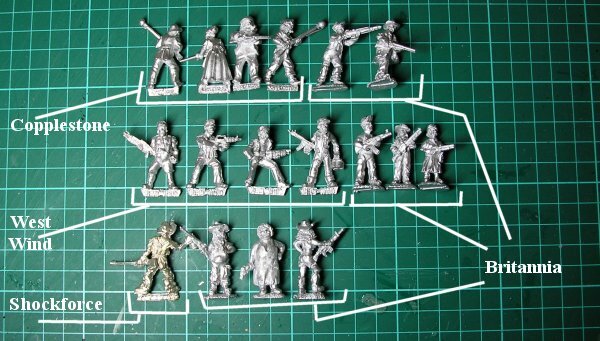 Here is a photo showing how the Britannia figures size up against some other manufacturers' similar figures. 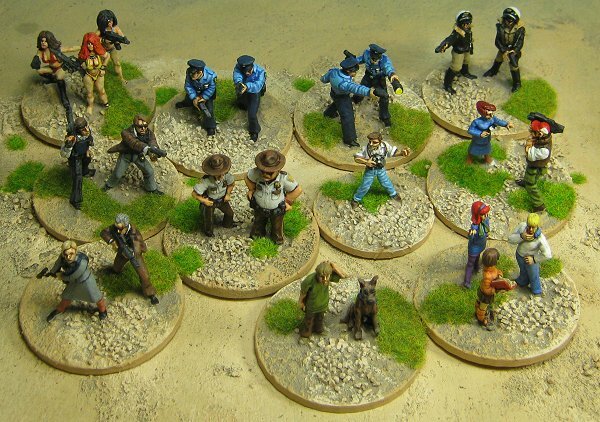 Having finalised the rules and decided on the factions I can now (three years later) get on with producing enough painted figures for the games. 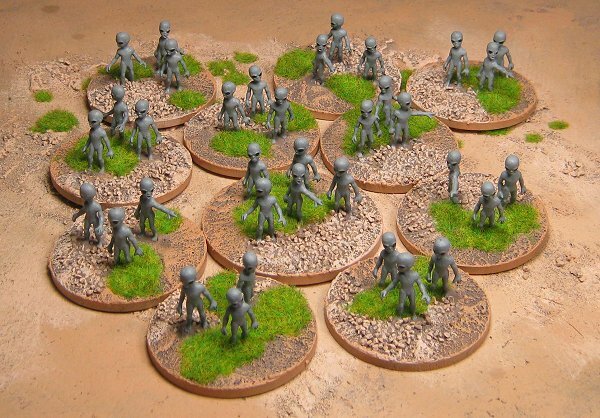 The first faction to get underway, because none of them are painted yet at all, is the Little Green Men. 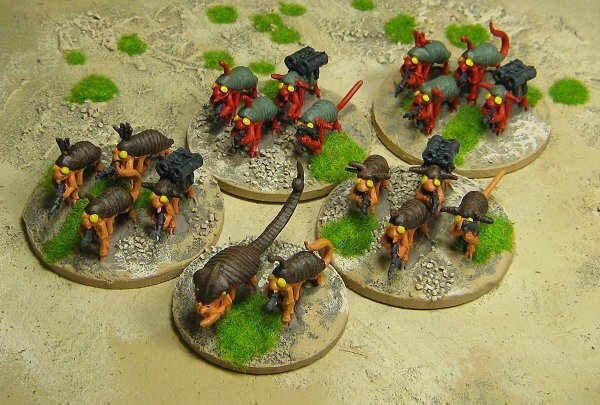 I've bought enough miniatures to give me a 2 man leader base, six 3 man troop stands and four troop stands each with a single LGM psyker and 2 tentacled attack monstrosities for a bit of variety. The miniatures are from Black Cat Bases. As you'll see if you read the rules I wanted Greys as the other alien faction. 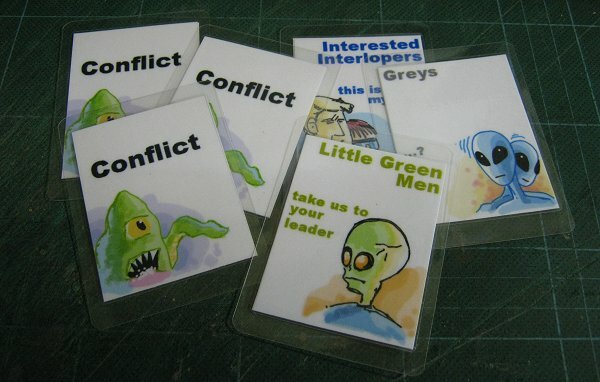 Unfortunately the Greys I have are big and mean and don't fit in with the light-hearted feeling of the game and the Greys I wanted to use that did fit the feeling, little humourous chaps from Zombiesmith, are quite expensive given the number I'd need. 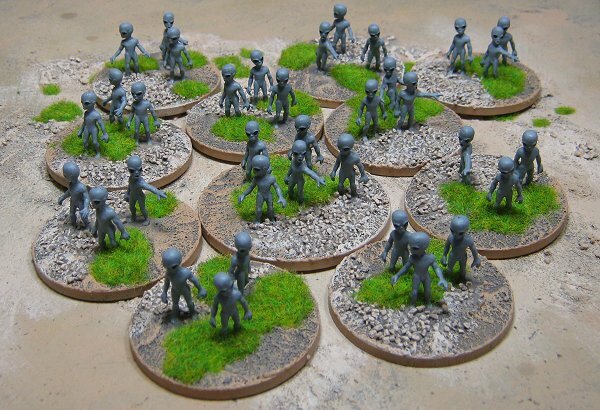 As a solution I've decided to use Spice Lice from Irregular Miniatures as the second Alien Faction. They're brightly coloured and slightly silly, perfect for this game. 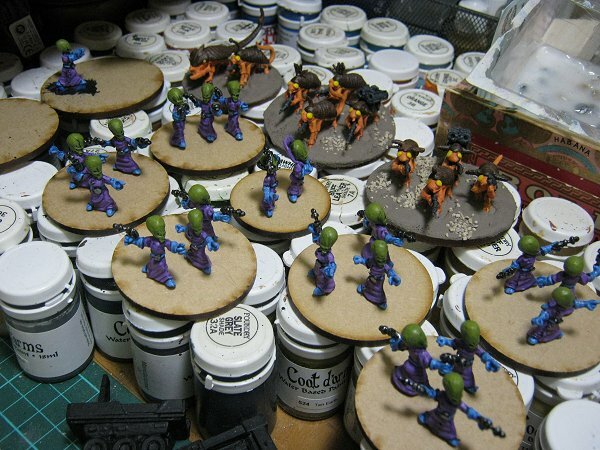 After a couple of days painting the Little Green Men are ready for basing and the Spice Lice are nearly completed, just the base painting to do. I have to complete the Tentacled Attack Monstrosities before I can do the LGM bases so that'll be in a day or so. You'll notice I've painted the Spice Lice orange and brown rather than red and green. I wanted to be able to distinguish the command Lice quickly. 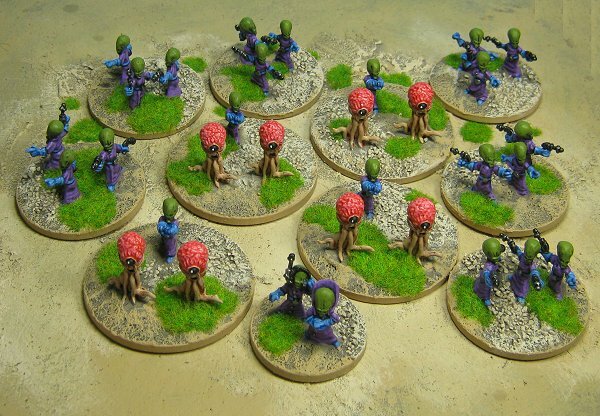 Here are the finished Little Green Men and their Tentacled Attack Monstrosities. And here are the new Spice Lice command caste. Since I've found some Greys now these probably won't be used for this project but you can never have too many Spice Lice. There are two bases of the original red Spice Lice at the back. 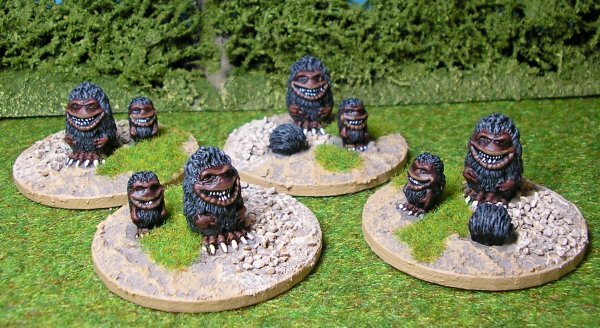 More stowaways; these are from Black Hat Miniatures, they're supposed to be wild haggis but I've renamed them Blue Meanies and painted them accordingly. More weirdness. STAs added to the mix. Fittingly enough these are cheap plastic toys from Hong Kong. loads more aliens!! 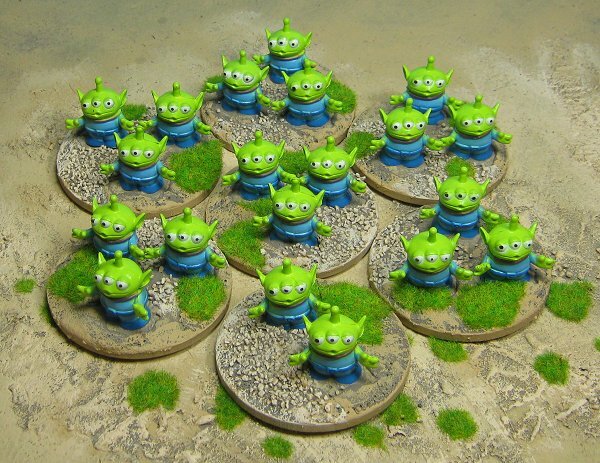 All are based on 60mm bases, most of these things are quite big. First up are the Grell and the Grell King, evil psychic beings from a far star. 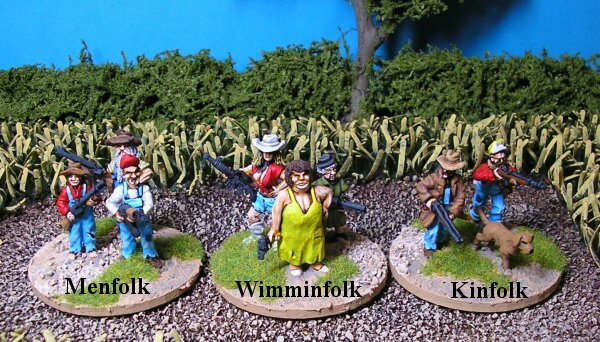 These will be joined by hordes of their brain-controlled human puppets when the meet The Doctor or UNIT in my Future Wars project but will stay as this compact, if deadly, little group when they land in the Hillbillies' back field. 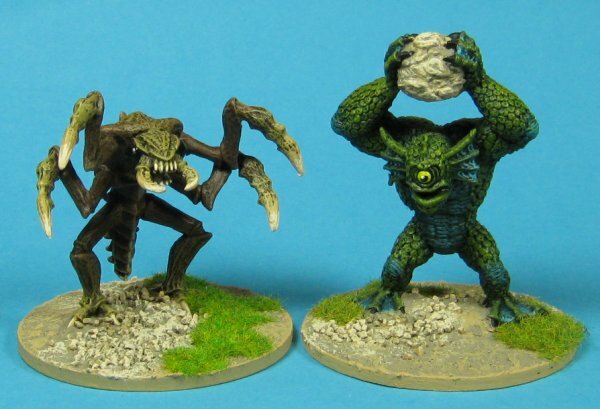 The Grell are plastic D&D figures and the Grell King is an OOP Reaper miniature. 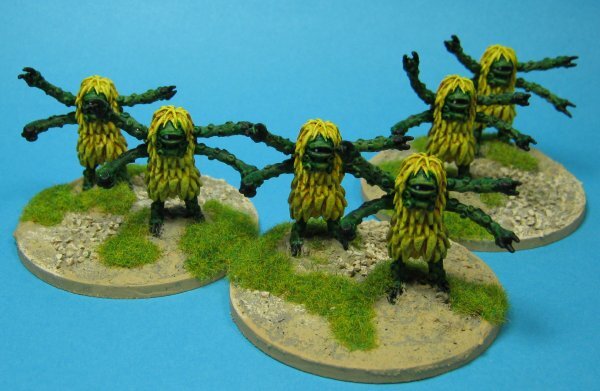 All these are Roper miniatures (painted green, clever huh? 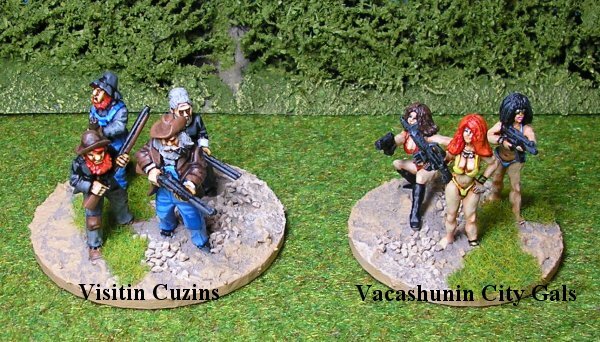 ), Pa is a plastic D&D miniature and the sons are from Otherworld Miniatures. 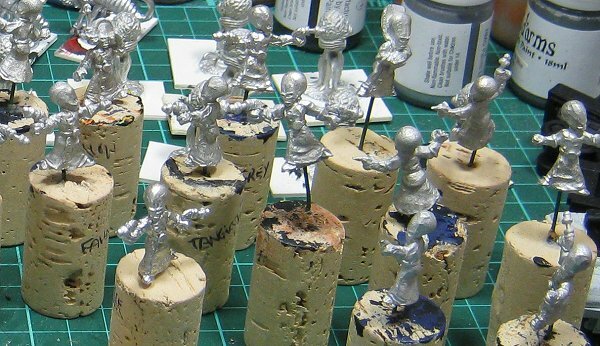 These are the Greys I got from Tengu Models. Tiny little chaps they are too. Here's the whole clan along with cousin Bigfoot and a load of nasty big Vendel dogs. Here is the whole Interested Interlopers faction. There's less than a week to go before I roll this out to be played as I write this. 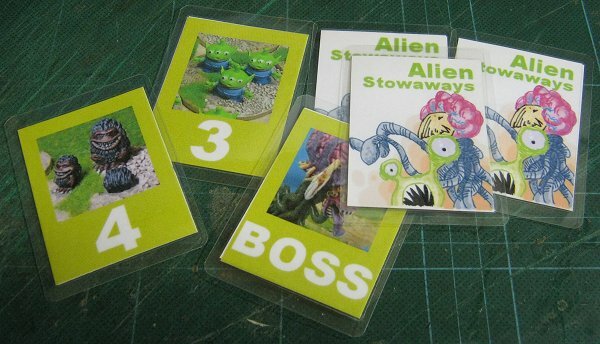 I've tweaked the rules so a new version will be available at some point and printed and encapsulated the cards. PDFs of the cards will also be available soon. 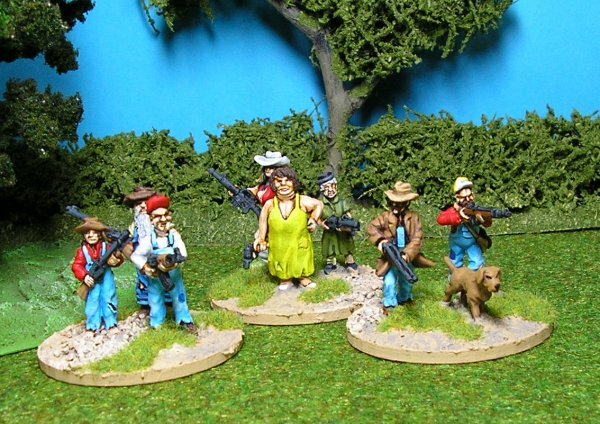 The first of the Hillbillies painted, these comprise the main family. Some more humans, the Hillbillies here are from Copplestone Castings. 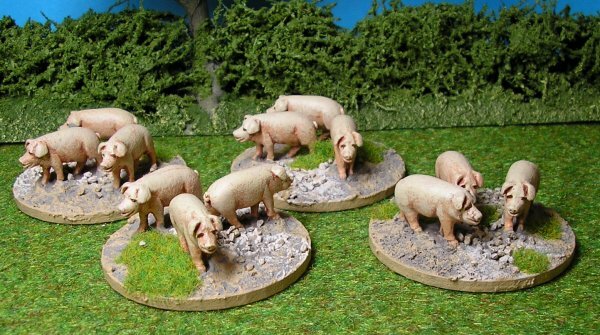 How can you have Hillbillies and not have pigs? 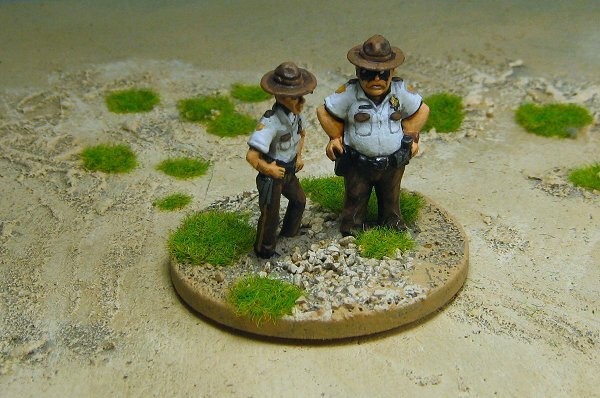 These fine specimens are from Irregular Miniatures. 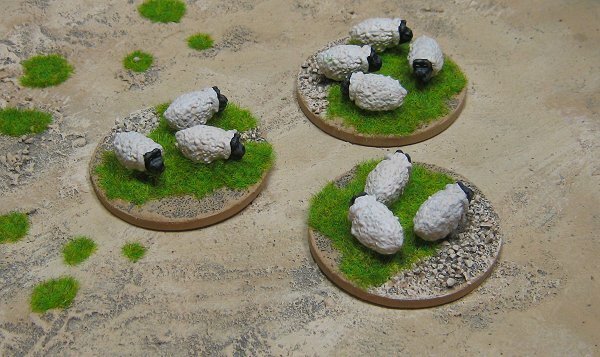 These little sheep are from Black Cat Bases. The first of the extra-terrestrial threats, spaceship stowaways. 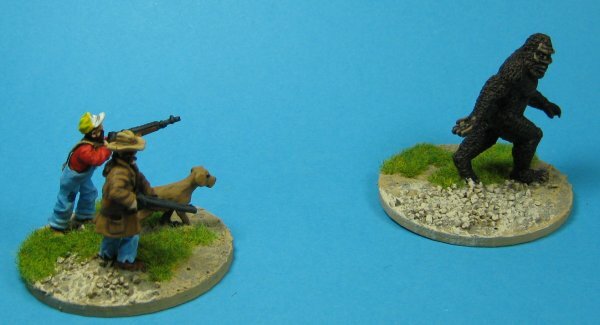 These little guys are from the Wargames Supply Dump. Here is the first of several Alien Overlords that has come to claim Earth as his own. 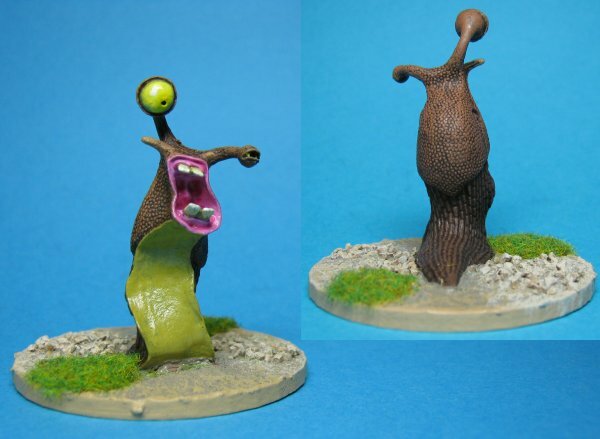 This charming fellow is Slug Eat Your Face from Thunderbolt Mountain. Slug Eat Your face was sculpted by Tom Meier and designed by his son Theo. Here he is with his giant Space Slug minions from Fenris Games. To add to everyone's troubles Bigfoot may pop along to see what all the noise is about. This particular Bigfoot is from Reaper Miniatures. 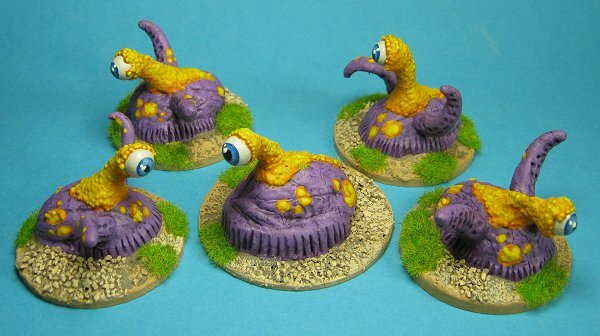 More nasties from the Wargames Supply Dump, this time evil Cyclopeans. Interfering Kids. 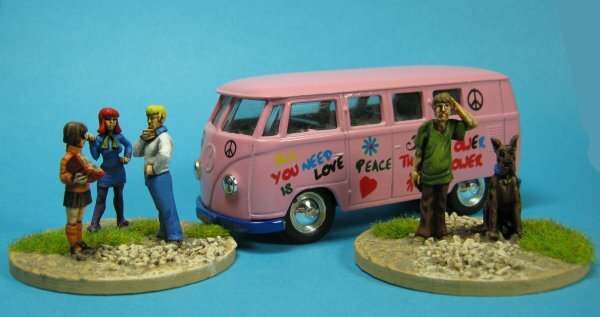 These are from Hasslefree Miniatures. 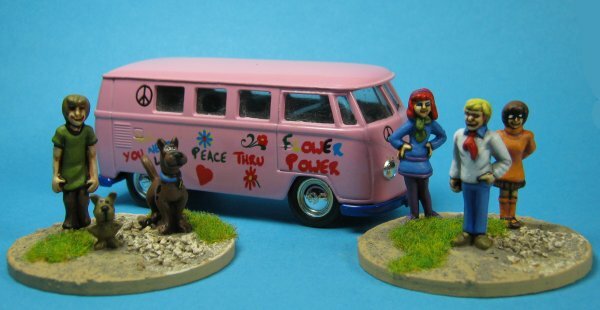 The van is by Lledo. These are from a train set. 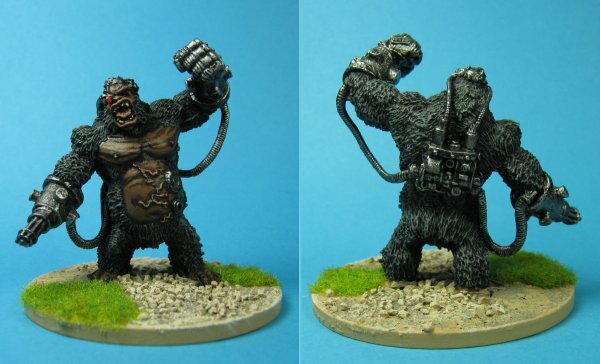 Another alien menace, Gorilla Grodd, War Ape of the Simian Empire! (He's from Reaper Miniatures). 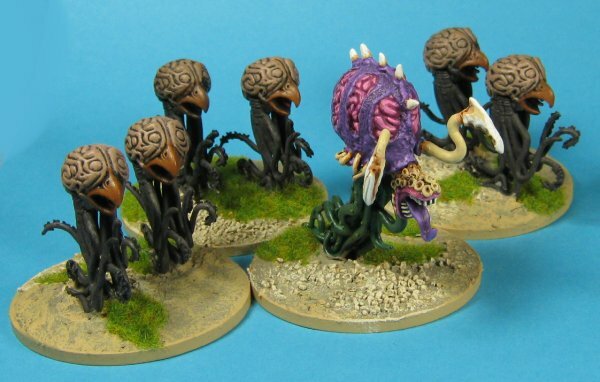 These chaps are an Aquacyclopes and a Giant Insect Warrior from Hydra Miniatures. This pair of Reaper lawmen completes my Interested Interlopers faction. A late entry to the mix, some Walnusians made for me by Dr. The Viking one of my Lead Adventure friends. They're brilliant models made from walnuts, a touch of Danish genius. 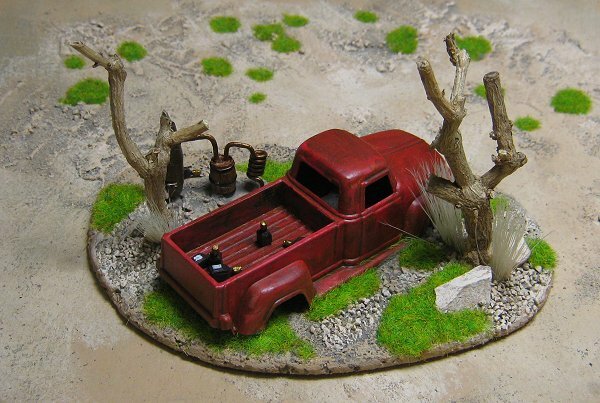 The last little scenery item, a still for the Hillbillies. 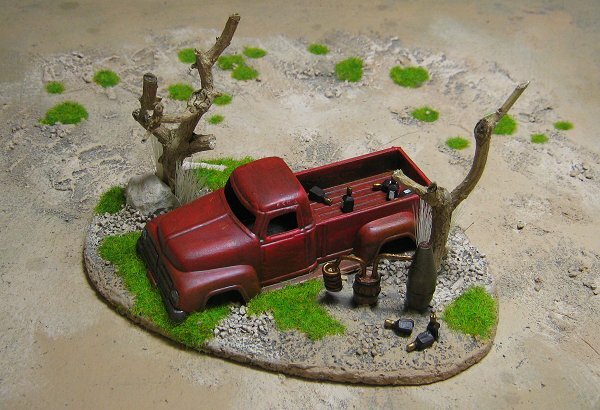 Truck is a Plasticville one and the still and bottles come from Black Cat Bases.